Ray of hope: (from left) Umesh Jagtap, Shrikant Dadarkar and Milind Shinde play three convicts. Photo by Kedar Bhat/Mint. “Allbeeeel (All well)", cries the police guard outside the prison cell shared by actors Umesh Jagtap, Milind Shinde and Shrikant Dadarkar, who play murder convicts. The very sound of it is evocative, poignant and laced with irony. It is just one of the many details of the Theatre of the Absurd captured with finesse by veteran film and stage director Sai Paranjpye, now a sprightly 73. She blows her little red whistle, dances, breaks into song, makes a few sketches for stage design, circumambulates the open stage— and has the National Centre for Performing Arts’ (NCPA’s) Experimental Theatre’s staff and crew constantly on their toes. It is the NCPA’s first production venture in 20 years, and who better to begin with? Paranjpye is the grand dame of the Marathi stage and she has repeatedly had the unique ability to assemble a motley cast of accomplished actors no one else saw working together. Of the actors, Jagtap, previously seen in Tim Supple’s A Midsummer Night’s Dream, a vivacious and versatile experimental artist, plays a man who killed his wife in a fit of rage when he discovered her with a lover. Dadarkar, the renowned classical vocalist and a darling of the Marathi stage, plays the break-into-song Bappa, who killed his blind daughter’s molester. Shinde, the more commercial of the three and a well-known film actor who essayed the role of the father in the National Award-winning Baboo Band Baaja, plays the prowling, mood-swinging, imaginary-cricket-playing contract killer with brilliance. “Laaga chunari mein daag" plays seductively as Shinde enacts one of his killings. It plays again, mournfully, as he is taken to death row. 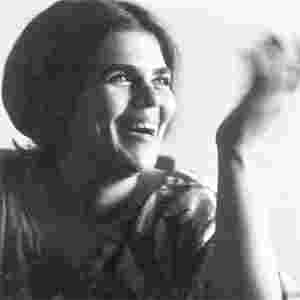 Paranjpye leans over, flicking her dupatta: “It is, in fact, a deeply spiritual song. It is a man going to meet his maker, knowing he has sinned. I hope the audience gets it," she says. Before rehearsal begins, Shinde, a National School of Drama (NSD) graduate riding the peak of his film career, explains why he is taking a break from shooting. “It is riyaaz for me." He is gently reminded to get the length of his jailbird shorts cut by the tailor after the day’s rehearsal. There is much an actor can learn from Paranjpye’s exactitude. A file photo of director Sai Paranjpye, now 73. Photo by Hindustan Times. His current play at Shivaji Mandir—that stronghold of Marathi theatre—is Pu La Deshpande’s Varya Varchi Varaat. Even when Tom Alter played in his Marathi adaptation of Waiting for Godot, he explains, it did not play to a full house. Which is why Paranjpye’s direction of an NCPA production in Marathi is significant. It returns Marathi theatre to a space where it interacted creatively with the mainstream—a fluidity once championed by veterans such as Shreeram Lagoo, the late Satyadev Dubey, Vikram Gokhale, and the late Chetan Datar. With Aalbel, Paranjpye is proving to be the mentor who is stepping up to the need of the hour. At the Experimental, the cast is aware it is facing a new crowd. There is an obvious difference in the air. “It is the difference between (Sachin) Tendulkar at Brabourne Stadium and Tendulkar in Australia," as Shinde puts it. Dadarkar is waiting for when the play goes “aapla gaavith (to our village)" —Dadar, the home ground. Even the stage at the NCPA is unusually open on three sides, forcing last-minute carpentry adaptations to the set so the audience on the side is not cut off visually. They will laugh at the wrong spots, or maybe not laugh at all—it happens in these kinds of places, say the cast members. The play is not an adaptation of Sartre’s tome. It is, in fact, the anti-Sartre. It is a concept, and a nod to the original the characters discuss at the start of the play. “Kharokhar tar majhi swargachi kalpana thodi vegali hoti. Tumhi doghi mala Rambha ani Urvashi nahi disat (Truth be told, my idea of heaven was a bit different. Neither of you—nodding at his prison mates—look like Rambha or Urvashi to me) ," Jagtap says with that wry humour integral to Paranjpye’s writing. The script, which Paranjpye wrote in three months, is similarly incisive. 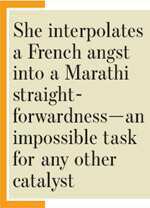 She interpolates a very French angst into a Marathi straightforwardness—an impossible task for any other catalyst. This finds beautiful expression in each of the actors’ piercing existential howls at the only glimpse of life outside their cell, the rays of the rising sun. Aalbel plays on 31 December at the Yashwant Natya Mandir, Mumbai, at 8pm and on 1 January at Bal Gandharva Ranga Mandir, Pune, at 12.30pm. The play will travel to other venues too. For information, call 9322389700.